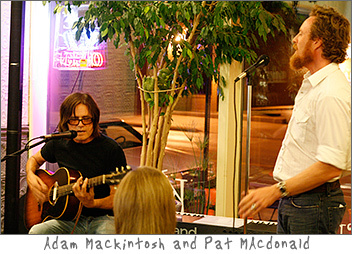 Adam Mackintosh is a unique American songwriter. After 6 European tours and three years in Wisconsin writing with some of the nations best writers. Adam has performed at over 400 concerts in the US and Europe to crowds ranging from 10 to 5000. His style of music has been compared to many of the greats, Harry Nillsson, David Bowie, John Lennon, Radiohead, George Harrison, Jellyfish, Old 97's, Big Star and The Kinks. Tonight he was playing on an older Gibson acoustic with a more subdued energy than what is carried on his recorded albums. His tone was soft, his vocals brilliant, and the use of chords and solo work were just amazing. I arrived a little late, but the majority of what I saw at the show was the many talented musicians and Adams collaboration with them on the stage or on the PA mixing board. Locally known artists like Connor Sands of Midwestern Charm, Palmer Shah, Jana Holland, Marybeth Mattson, Pat MAcdonald and many others came out to share their songs and talent tonight. It was a great mix of styles and the musical talent was amazing. The sense of community at Kavarna was heartfelt and the influence that Adam has had on our music scene will continue to last and grow while he is out making his mark in California. 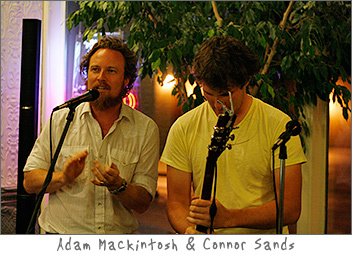 Adam's jams with Pat MAcdonald during the encore and close of the night were so cool and in true songwriter fashion. 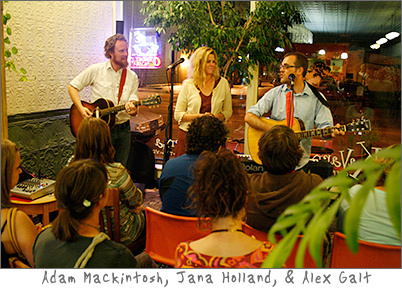 A special thanks goes out to Kavarna owner and musician Alex Galt for giving music such a special place grow. You can catch Kavarna's food and music lineup on their website. To check out Adam Mackintosh's music go to his website and order his new album "Last Dancers" I hope they love him as much out in Cali as we do here! Come back soon!